Do you remember your Graduation Day from Buffalo State? Hearing your name, walking across the podium and celebrating your hard work? It’s a day you will never forget! Commencement 2015 is just days away, and the campus community is gearing up for graduation day. Whether you are a student, faculty member, alumnus, or a parent, we each play an important role in this annual tradition. Help us celebrate the achievements of our alumni! Send your congratulations to the Class of 2015. 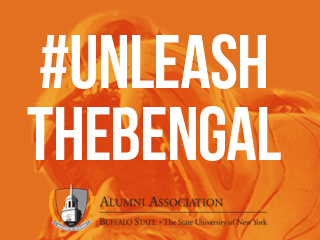 Tweet your message or share your Instagram photo using #unleashthebengal and see it on our spirit wall at UnleashTheBengal.com. Be part of the conversation and welcome the graduating Class of 2015 to the Alumni Association, over 100,000 strong. Let’s show the world our talent, our pride, and our future. Unleash the Bengal!